A simple, step by step guide on how to be a successful, published writer by one of the best in the business. Speaking from years of experience in the publishing world, Barbara Hayes gives her advice and guidance to anyone who wants to be a successful and published writer. Barbara has worked on comics, newspapers, magazines and books, building up a unique breadth of expertise in many different types and formats of publishing. 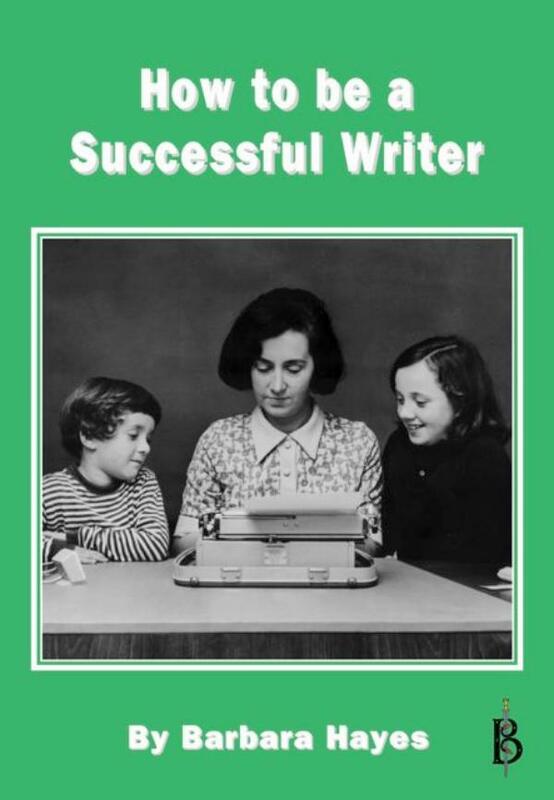 Whether the would be writer wants to produce poetry, novels, factual books or short stories, this book contains practical and sensible advice on how to go about getting published. Barbara Hayes has recently retired after a lifetime spent as a successful writer. She began in Fleet Street in the 1950s, and over the years she has had some 80 books and about 7300 scripts published by companies from England to Australia to South Africa to Florida and back to Holland. So she knows what she is talking about. Always be on the side of the masses. Genuinely on their side, not writing that way to please the editor. When you hear of your country‘s/club’s football fans fighting another country's/club’s football fans in running battles through the streets and the sanctimonious politicians stand up wearing sackcloth and ashes wailing how terrible it is; if you think “Good on you lads! Give them one between the eyes for me!”, you are well on your way to success. Ideally you are a lightly educated barbarian with no letters after your name, so even when you are well launched into your career, you will never be asked to write a book for experts. However, as you are cheaper than an expert and as also you can write something readable, you will frequently be asked to write books on special subjects for the general reader. That is to say books covering the subject to a depth suitable for intelligent people who have too much house-maintenance/car cleaning/child-caring/wage-earning to do to have time to more than glance at a book on the train or before falling asleep with the light on in bed. So read widely yourself. Learn everything you can, but only to a certain depth. You will never need more. Know offbeat little facts like - when the railways came and slate could be transported cheaply, thatched roofs went out and slate roofs came in for the masses and consequently many diseases died out because they were no longer being spread by the vermin which lived in thatched roofs. People with AB blood group are descended from the original hunter gatherers who came into Britain at the end of the ice age in 7000 B.C. (I am AB and truly loved that piece of information when I read it - as I am sure will every other AB type. So that is several thousand readers who will go on scanning through this writing in case they learn anything more about themselves - and every reader is a good reader. Incidentally there is another snippet for the AB types, but there is no room here. I will put it into the bit about ghosts later on. Back to some offbeat little facts - but interesting. (I think so anyway). You needed a passport to travel on the Roman Roads. When Caesar first attacked Britain in 54 B.C. he sent back a report to Rome saying that the inhabitants of Britain were fit only to be sold as slaves for agricultural purposes - the Romans probably think the same to this day. About a hundred or so years later when the Romans invaded seriously the generals wrote back in astonishment to Rome saying that the British warriors would as willingly follow a woman leader into battle as they would follow a man - nothing changes does it - ask Mrs. Thatcher! These are amusing items which will always fill a space. Read, read, read and store up bits of information. Readers love to improve their knowledge, but only with fun snippets. So there you are folks. Now we know. And if you are paying attention about learning how to be a mass market writer - I do hope you have not been dozing off - little anecdotes are fun, aren’t they? Try to accumulate them concerning your own people and country. People like reading about themselves. Be able to have a drink without becoming an alcoholic. So many writers and artists seem to drink too much - remind me to tell you why later when there is a bit more time. For you the rule is never drink when you are writing. Never drink when you are seeing a publisher. Drink only when the work is done, the cheque is in the bank and when you are with personal friends. Then have a great time - cheers! Here is some more advice about what to write: Go with the trend. Don’t be proud. Good ideas do not come around that often. If space adventures are selling like hot cakes - you write space adventures - after you have agreed a fee with a publisher of course. If a picture strip about behind the scenes tennis scandals is pushing up the sales of a newspaper, submit the idea for a picture strip about how to get to the top in tennis to a rival paper. Of course have it ready with the story line for the next six months, character sketches from an experienced artist and the name of a tennis hero who will give you the inside info. A lot of success comes this way. I will tell you how to write scripts for picture strips and how to deal with artists later on when we have more time. Of course never copy anything exactly. You do not want to be sued. The educated, intellectual classes - note my working class prejudice continually coming out - Yeah!.......The educated, intellectual classes call giving info in jolly snippets dumbing down and regard your readers as feckless, couch potatoes. You will know that your readers are busy people and you think it is pretty good that they are spending the money and taking the time to read a book/magazine/article at all. But you think that because you like them. Those who are able to pay others to do their chores or look after their children may sneer at the mass market and endlessly signal in their conversation, t.v. discussion programmes or newspaper articles that they went to private schools, are politically correct, would not dream of ever waving a Union Jack or - horrors - flying a cross of Saint George on their car - or God Forbid their white van - and that they have never set foot on the Costa Brava and that they do not have a fish knife in the house. You see what I mean? A prejudiced rant can usually raise a cheer - from the right audience. But always keep it lighthearted. Everyone has feelings. By the way, you will have noted that the above prejudices are all English and if you are English you will have understood them and hopefully had a chuckle. If you are not English and found them incomprehensible and therefore boring - there is another lesson for you. Always write what is easily understood by your target audience or you will soon lose them.